These popups come even when IE is not running, about one per hour. They are on some kind of a timer. I find this a really amazing scam, as AOL bombards me with unwanted popups, in order to sell software that promises to put an end to it. There isn't much sympathy for the AOL users, but let me ask this. Since AOL has it's own army of support staff, what do they say about this? Do they tell you where the OFF SWITCH is? And I don't know since I am not an AOL subscriber and AOL does not share it's knowledge base. Thanks. I am not using AOL. This is a case of AOL sponsoring adware (2nd-Chance) which causes the very disruption to the user that they are advertising a cure for. I hope there will be a congressional investigation of AOL and this practice, as it basically amounts to racketeering and corporate sponsored extortion. You as a non-AOL user and PARASITES. It's possible you have some PEST or PARASITE installed. Before you exclaim that such is extortion, most, if not all the pests I've encountered are installed by the user of the machine. A fine example is AOL IM (instant messenger.) 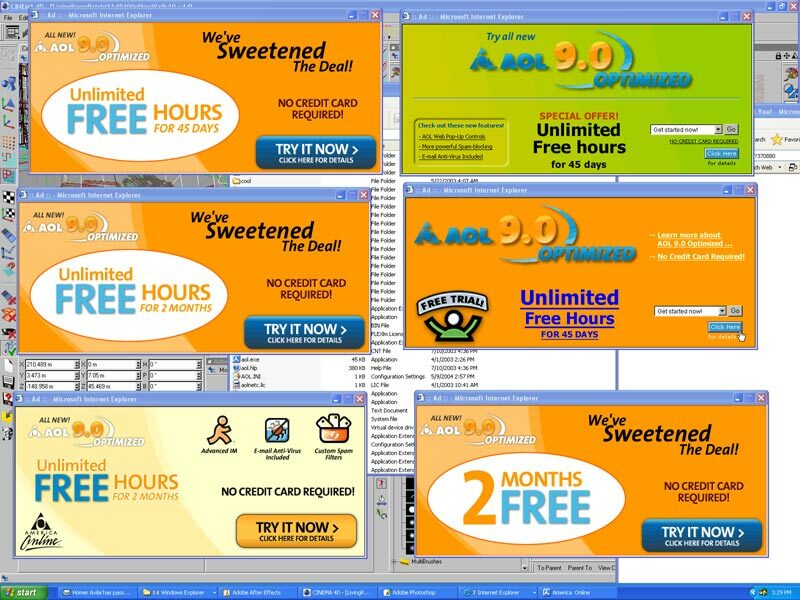 If you install such, then you agreed to take the advertisements. Most of us will use tools like ADAWARE, SPYBOT, CWSHREDDER and get a clean pass of HOUSECALL and that cleans up most pests. If not, HIJACKTHIS can reveal what else is in there, but its a power tool which you can do damage as well as good. Be careful with that one. If you elected to use something like AIM, then you can't complain (to me at least) when there are replacements such as GAIM and you can also kill such with Zone Alarm. Re:You as a non-AOL user and PARASITES. In reply to: You as a non-AOL user and PARASITES. It's possible I installed something that installed adware without my knowing, but it is nevertheless a pest, akin to a virus. I made no concious, knowing consent. The fact that the pest manifests itself as advertisements for AOL indicates that AOL is sponsoring the pest/virus by paying them. The fact that the AOL ad is one for getting rid of the same pests that delivered it, clearly fits under the common definition of extortion. In reply to: Re:You as a non-AOL user and PARASITES. Just kidding. There are tools to deal with this and if you used AIM, then you get the messages. Look at alternatives and the usual tools to knock it out. Of course, no one expected the Spanish Inquisition. In reply to: So pay up! I don't use AIM, so I don't need to look for alternatives. I got the tools to deal with it. What you don't seem to be able to grasp is the fact that the companies seeking to profit from the tools to solve the problem are the ones responsible for the problem in the first place. Does nobody get this? In reply to: Re:So pay up! And write a lot of responses helping people remove the pests. The "problem" is that we have both legitimate and illicit adverts. Before I write one more word, I must comment that complaining to me does nothing. I know the issue and am eductating as many as I can. Let's find your advert source and turn it off? My reference to AIM is because the advert you revealed is "the usual." Happy hunting, and in parting, as long as you use Internet Explorer then the pop-ups and ads will constantly be yours. I flipped to using Mozilla, which is my choice and never see the ads you disdain. Some will not want to make such a change and will have to find other solutions. In closing, many web sites pretty much write "you look at my web site and I give you an AD. And you agree to this by coming here." Short answer? Don't go there. If you wish to discuss the political, moral and non-technical aspects of this advertising, then please post in the Speakeasy Forum. I agree I cannot stop them, AOL tech support knows about them The AOL Support guy in India said he had the same problem but could not help me. I have McAfee,regicure, and cannot understand how these popups occur they seem to be offering me mirror software stuff of the sites I visit,when ever I do a search in AOL the Internet Explorer goes mad and tries to connect me to another advert site when I am already connected to AOL. Its doing my head in. Important information regarding the shutdown of AOL Message Boards.We regret to inform you that AOL Message Boards has been shut down. I wonder why. I was getting help from some of its subscribers, though I am still plagued by the popups I now realise it is ADWARE-ONESTEP. My McAfee will not fix it and Regicure does nothing. I am going to buy SPYware Detector. Though from what I have read these people are all in bed together. I am with AOL and it is getting really bad now. When I am on the AOL homepage a full page add comes up, I delete it and then (what is it ?) IT opens up Internet Explorer and more adds popup, it has completly taken over my puter. I get them everytime I use the search bar on aol homepage. I did download Mozilla firefox and that works fine, but being in my late 60s I am a bit slow at learning a new method, besides I like my AOL homepage and know where everything is. But sadly I get no help from AOL.Even though I pay them For security Suite which includes McAfee, Fat lotta good they are. The McAfee tells me I have a problem but fails to fix it.